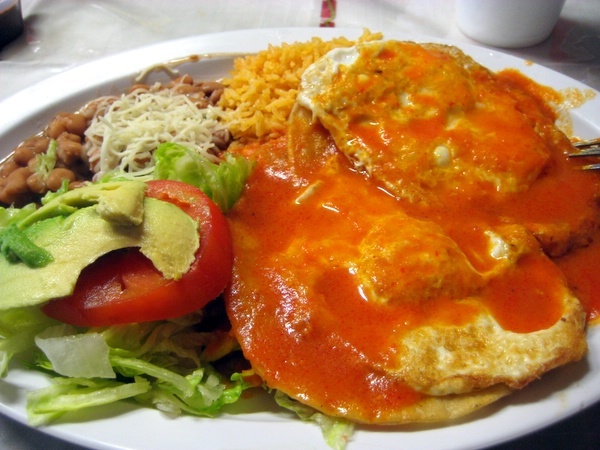 Huevos rancheros (“rancher’s eggs”) is a popular breakfast dish consisting of eggs served in the style of the traditional large mid-morning fare on rural Mexican farms. The basic dish consists of fried eggs served upon lightly fried corn tortillas topped with a tomato-chili sauce. Refried beans, slices of avocado, or guacamole are common accompaniments. Prepare the eggs as you normally would if you were making fried eggs. When cooked, place on top of the tortilla. Top with red sauce, add toppings and salt to taste. Alternatively, you can also add the refried beans unto the tortilla before adding the eggs.